Would you like ages included? If so what is the appropriate age(s)? These Mickey and Minnie Mouse centerpieces are a great addition to any Disney themed birthday celebration! The centerpiece includes 1 Mickey Mouse, 1 Minnie Mouse and 1 Mickey Hands making a heart, for a total of 3 pieces. Ages can be added to the Mickey, Minnie and/or heart. You can also choose if you would like 2 Mickeys or 2 Minnies, instead of 1 of each. These are great nestled in a simple bouquet of flowers, a plant, a mason jar or vase with a simple ribbon, etc. The sizes of the centerpieces vary, but for reference, the Minnie and Mickey silhouettes are approximately __ in. x __ in. The colors of the pictured centerpieces are: black, white, red, yellow and a little pink for the Minnie Mouse bow. The patterned paper is black with white polka dots. . If you have a different color scheme in mind, please let me know, and I will do my best to fulfill your needs. This design would be easy to adapt with just Mickey Mouse or just Minnie Mouse. Custom orders are always welcome. 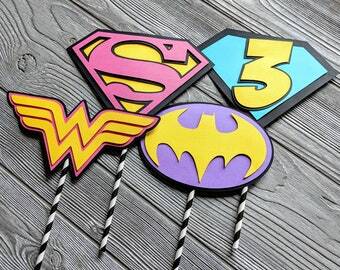 If you would like to add matching banner, cake topper or cupcake topper, please let me know.